How can T-shirts promote my business or organization? Whether you’re a business owner trying to promote your products and services, or an organization that’s trying to build pride or raise awareness, there are a lot of choices when it comes to getting your name and message out there. While other types of advertising can work well in many situations, it’s no secret that people love to wear T-shirts. How many T-shirts do you have in your closet? And how many of those do you find yourself wearing over and over again? Maybe it’s the design, or maybe it’s the message. Or maybe it’s the way it makes you feel when you wear it. At Excel Sportswear, we’ll help you bring your ideas to life to create your next favorite T-shirt — a great custom design that your customers, members, students, family, and friends will love and want to wear. We make our entire process very easy for you and accept no compromises. There is simply no easier or better way to show your pride and get your message and name to your target market than with a great looking screen printed T-shirt! Place your order. Tell us what you’d like to feature on your new custom shirts and one of our design consultants will help you get your perfect design together and get your order started. They’ll also help you determine how many shirts you’ll need, and give you some options for what types and color of garments will work best for your design. Our artists create your design. You don’t need to be able to draw or even provide us with any type of artwork. All we need are your thoughts and basic ideas, and our artists will create your design just for you. You review your design. After our artists hand draw your design, we’ll email a design proof to you. This proof will show you exactly what your new shirts will look like! We fulfill your order. We fulfill your orders right here in our production facility — all of our artwork and printing is done in house so we can be sure of the quality of each and every shirt. Your order will pass through six quality control check points to make sure that it comes out perfectly. Your order is delivered to you. Your order is hand packed and shipped directly to your door, via FedEx. Every one of our custom designs is drawn by hand for each customer by one of our in-house artists. We pride ourselves on our artwork, and while it is extremely important that we get your custom design and shirts to you as quickly as possible, we also want to make sure your shirts both meet all of our quality standards and surpass all of your expectations. The time frame to complete your design is determined by your needs, as well as the complexity of the art and of your design. For example, more simplistic designs can be ready for you much faster, while designs that feature custom vehicles or machinery or are very art intense may take a little longer. Be sure to ask your design consultant for a more precise estimate when you place your order. Need great custom shirts in a hurry? Rush orders and expedited shipping are available for an additional fee. How much do your shirts cost? That’s a fantastic question! It’s kind of like asking, “How much is dinner?” It all depends on where you’re eating and what you’re having to eat. Imagine a restaurant where you could walk in and order anything you want and they would make it for you. Obviously, a cheeseburger would be less than the prime rib, and a plain pizza would be less than one that had all of the toppings. Excel Sportswear is that “restaurant” where you can get whatever you want, made to order…but for T-shirts! Our prices vary for each order and are based on a number of factors. The color of your shirt, the quantity of shirts you’d like to order, the number of locations where the shirt will be printed (front, back, sleeve, etc. ), the number of ink colors that are needed to print your design, and the complexity of your design, all affect the price of your shirts — and you have complete control over all of these factors. This level of customization, which we offer for every one of our orders, is just one of the things that really sets us apart. And, we offer this level of customization with no art, screen, or set-up fees with any order — just one price. That’s another way in which we make it easy for you. We give you the ability to get a great, custom T-shirt for just about any cost. It all comes down to what you’re hungry for…a cheeseburger or the prime rib? Finally, for a truly accurate price quote, give us a call at 1-800-784-8857 to speak with one of our design specialists, who will discuss your wants and needs to determine the most accurate pricing for you. You can also contact us through our web form any time, day or night. 1. New Orders that must ship within 10 business days of order date. 2. Reorders that must ship within 5 business days of order date. 3. Any order not previously noted for a rush date that must ship within 10 business days of date approved. We prefer payment by credit card or check. Your design consultant can give you more information about our payment terms and policies. We’re available by phone at 1-800-784-8857 from 8 AM to 5 PM, Eastern Standard Time. You can also contact us through our web form any time, or send an email to info@exceltees.com. Can I add some kids’ shirts to my order? This may or may not be an option, depending on your design. We’ve found that youth medium and youth large T-shirts can generally be printed with an adult-sized print, but that youth small T-shirts are a little different. For example, our typical design for an adult shirt is roughly 13” wide x 15” high. If you’d like to have it printed on a youth small T-shirt, the image will probably end up being printed onto the sleeves at the top of the garment. Now, we can print smaller prints on youth garments, but the design will end up having a much different appearance than the larger adult garment that it was designed for. Additionally, if you want to add youth-sized hooded sweatshirts, the pockets on the garments will also affect the height of the printed image. And if you need toddler-sized merchandise, we’ll definitely have to make the artwork smaller, make separate screens, run it on a special press, and you’ll need to order a minimum of 48 pieces. If you’d like to order these smaller garments, please let us know when you place your order. Understanding your needs more fully will help us create the best possible design for you. Can I add pocket tees to my order? If your order is designed for left chest artwork, and the artwork has a height of 3″ or smaller, we can print it above the pocket. Another option is to print the left chest artwork on the right side of all the T-shirts in your order. However, we can’t print the artwork on the pocket unless the entire order is for pocket tees, since printing on pockets requires its own set of screens and the presses have to be set up in a completely different way. Can I add hooded sweatshirts to my order? We can add hooded sweatshirts to your order if the artwork for the front of your T-shirts has a height of 10″ or less. Can I add hooded sweatshirts with a zipper to my order? We can add hooded sweatshirts with a zipper to your order if your artwork is designed for either a left chest or a right chest. A print in the center of the chest would end up distorted from being printed on top of the zipper. Another option that’s available when printing these kinds of sweatshirts is to only print the back design and to leave the front blank. Can I add polo shirts to my order? We can add polo shirts to your order if your artwork is designed for either a left chest or a right chest. A print in the center of the chest would not be possible and it would end up distorted from being printed on top of the placket. You are also limited to the type of polo shirt that you can add to the order. For orders that are screen printed, you would have to choose a jersey knit polo shirt in either a 50% polyester and 50% cotton blend, or a 100% cotton polo shirt. Fortunately, we have several of these types of polo shirts available for you to choose from. The polo shirts would also have to be the same color as the rest of the merchandise on your initial order. What’s the minimum number of shirts I can reorder? For white or ash-colored merchandise (lights) , the minimum reorder quantity is 48 to 60 pieces, depending on the complexity of your design and the number of colors (screens) that it uses. For black, navy blue, and any other color of merchandise (darks), the minimum reorder quantity is 72 pieces. You may mix and match the style of garments to reach the minimum reorder quantities, provided they all use the same imprint. As an example, if you’re reordering 72 items of navy blue merchandise it could be comprised of 24 T-shirts, 24 long sleeve T-shirts, and 24 sweatshirts in assorted sizes. How long will it take to get my reorder? It generally takes seven to ten business days for your reorder to be processed and fulfilled, depending on our production schedules. Quicker turnaround times may be available — check with your design consultant at the point of sale, if you need something faster than that. How do you create my custom T-shirt design? Once we’ve had a conversation with you and discussed all of your design ideas, and you place your order, it goes to our art department. That’s where the real magic happens. One of our talented in-house artists will begin to bring your ideas to life. Your needs and your market will determine which artist will work on your design. Sometimes we’ll work with just an idea and your vision, and other times, we’ll work with photographs and your vision. 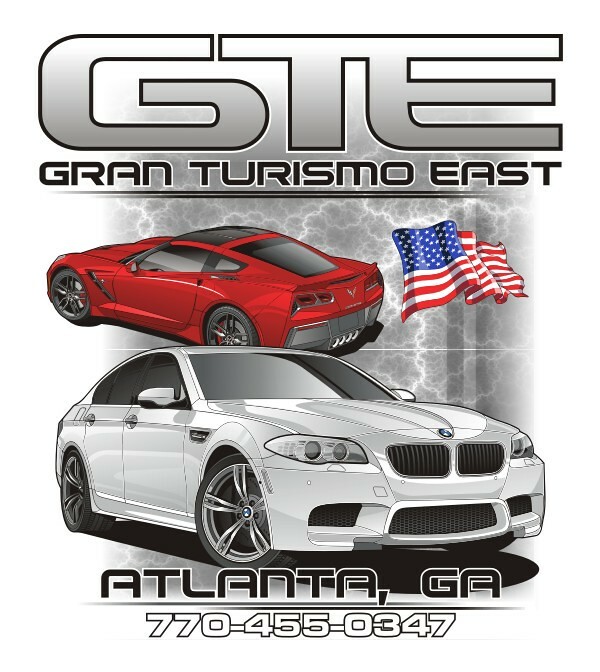 In either case, we will do everything we can to exceed your expectations of what your design will look like. For instance, if you own a towing business, we would like to see pictures of your tow truck. If you’re a member of a volunteer fire department, we would like to see pictures of your trucks and apparatus. 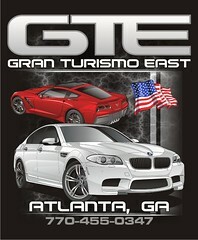 If you own a body shop, we would like to see your building or your project car. Whatever you want to feature in your design, we want to see it, just as you see it. When you’re sending us pictures, the best pictures to send are pictures at the highest possible resolution. We also need pictures that show the object (your truck, tractor, car, etc.) exactly as you want it to appear in your design. This will allow our artists to get the most detail and best possible accuracy for your design. We want to get it right the first time! You don’t need a fancy camera to take good pictures for us. Pictures taken with smartphones can provide an excellent level of detail for our artists to work with, and many smartphones have default settings that take pictures at a huge size and a high resolution. And don’t worry — it’s impossible for you to send us too many pictures or pictures that are too big! What if I want my design on both black shirts and white shirts? 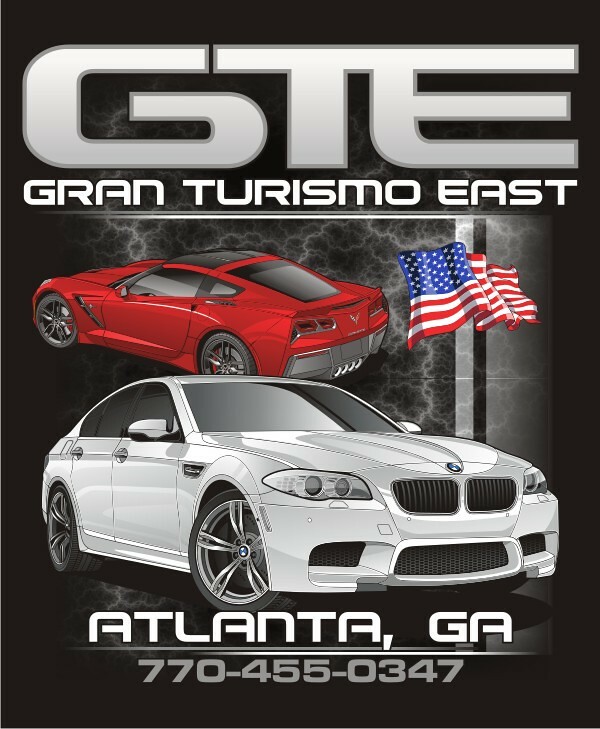 Our custom design for Gran Turismo East in Atlanta, GA, set up for black shirts. 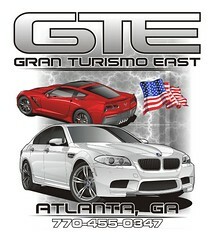 Our custom design for Gran Turismo East in Atlanta, GA, set up for white shirts. Although the design is the same, the presses and inks were set up in a completely different way — and for the most part, we need to set up our presses separately to print on each different shirt color. If you’d like to have your artwork printed on multiple shirt colors, tell your design consultant so they can make sure that your order gets written and submitted correctly. In many cases, multiple shirt colors will require multiple orders of the minimum quantities. If you have questions that aren’t answered here, just contact us and we’ll be happy to help.